That's what it says at the top of the pattern of this little cardigan I'm knitting. That should have been a good enough reason not to start it in the first place – but I do love a challenge. It might also explain why this particular garment has sat in the UFO (unfinished objects) basket for more years than I can count! Anyway, since it's getting warmer and I've needed something to do while recuperating, I've dragged it out of the basket. It's knitted in bamboo yarn, which is lovely to knit with, but it's definitely not a pattern I can manage while watching TV. 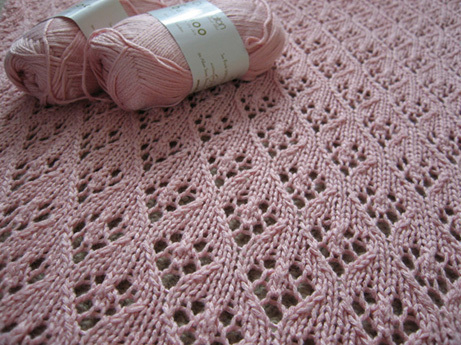 Especially now that I'm onto the front sections which require increasing and decreasing while sticking to the lace pattern. That, and it's not exactly the easiest pattern to follow. I've been having an ongoing email conversation with the patternmaker who said they have rewritten later editions to make it clearer. Already today I've started and undone the left front three times! What's the most difficult craft project you've ever embarked on? Is this the one that is all over your lounge room at the moment? Yep - driving me slightly mental this one!